The goal of this project is to develop robust measurement methods and analytical techniques for detecting and characterizing release from consumer use nanocomposite materials. This is an ongoing effort to assess the robustness and appropriateness of various existing measurement techniques for various release scenarios and develop easily accessible methods for determining release potential from various nanocomposite materials used in consumer products. 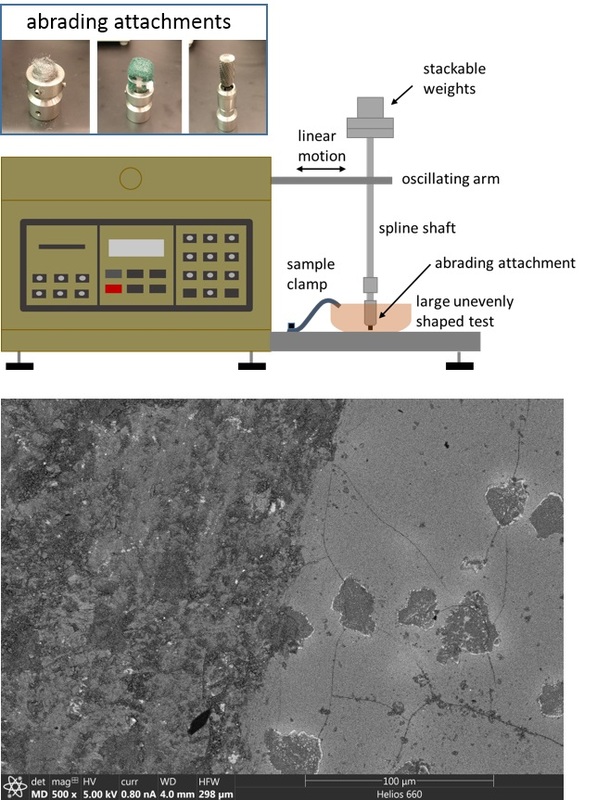 Linear abrader setup for simulating various release scenarios and an example SEM image showing abraded surface and pristine surface. Abrading attachment shown are steel wool, scouring pad, and carbide burr used to simulate moderate to aggressive cleaning processes for pots and pans. Displayed figure shows the abrading setup used in a recent study to simulate several different release scenarios during moderate to aggressive cleaning processes for food contact materials such as ceramic coatings used for pots and pans.